Just before we left for this trip, I bent our car. 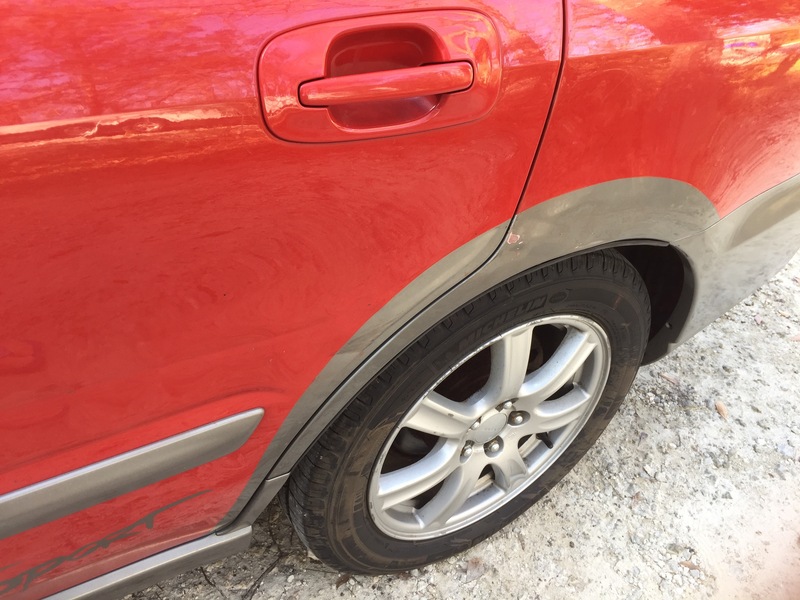 I was trying to pull around a friend’s car and mis-judged the turning ratio of my the Subaru, resulting in a creased door panel and a dent in the wheel well. A few days later we pulled into a campground to stay for one night, and Ben mis-judged a turn wth the motorhome. That left a bright yellow stripe of paint along the bottom of the bay doors. So it was that we arrived at our destination slightly worse for wear. We just pulled into our designated place in the campground when an aging Buick appeared. “Hey, I see you got a dent, I can fix it!” This is how we met Bernardo and his little family. He was with his wife Maria and daughter, Lia. Maria was a few months pregnant. Ben and Bernardo chatted for a few minutes, and a deal was struck. 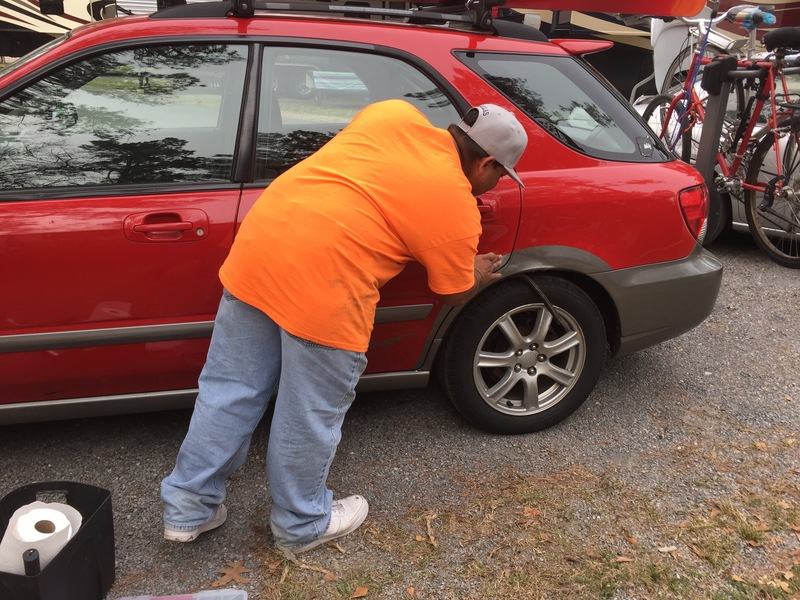 We were parked for one night only, so Bernardo got straight to work, pulling out his tools. His daughter Lia is a sweet girl of about 8. She enjoyed meeting Ryder and Henry. “We had a dog, but he got sick so we had to send him away,” she said in a soft voice. In a few minutes she was playing with other kids in the RV park. Bernardo explained his dent removal process step by step, proud of his work. I asked him if I could take his picture. “I won’t show your face online, I never do that and if you say so I won’t use your real name,” I told him. He said “well, to be honest, I work at a collision shop and I moonlight on the weekends. 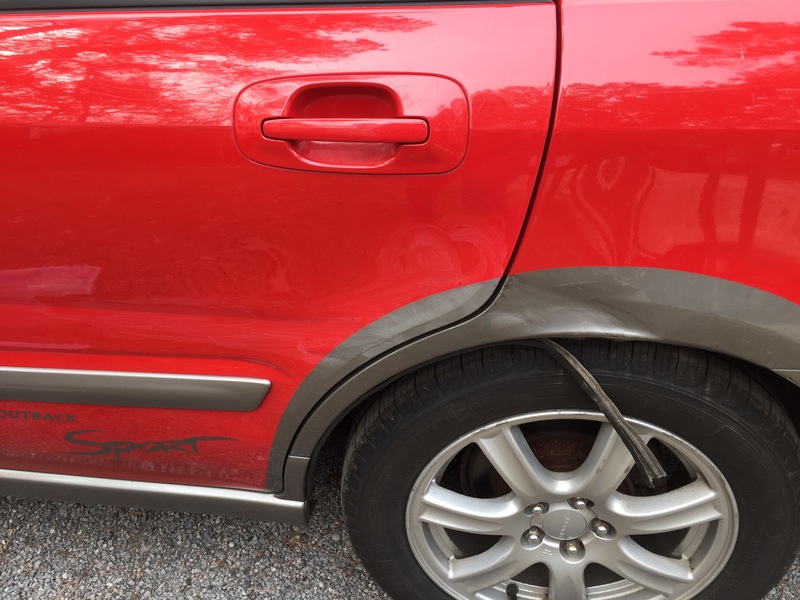 I don’t want my boss to know.” He worked on our vehicles for a couple hours, and charged us a fraction of what it would cost to take it to a regular collision shop. At one point he had to move his car to let another camper get by. The elderly Buick wouldn’t start, so in a well rehearsed performance, his wife slid behind the wheel and he popped the hood, fiddled with something, his wife turned the key and the Buick coughed to life. As you can see from the pictures, he did a good job. The RV and the Subaru are both over ten years old, so we don’t have any showroom expectations for either one. We paid him his modest sum, and he gave us his phone number. “If you or your friends need anything, give me a call.” He called Lia away from her new friends and the old Buick lumbered away. The three of them waved to us. I thought a lot about Bernardo and his family. He’s likely not one of the better-paid employees at his workplace, and I wondered if he’d learned to do dent removal through observation. His “tool kit” was definitely improvised. He told me he is from a big city up north, and for whatever reason he is here now. Yes, he is an immigrant and his appearance fits the most recent stereotype for people of Latin descent that is being promoted by our country’s leaders. He’s hustling to make a living for Maria and Lia any way he can, living on the knife-edge of poverty. His car was clean, his daughter and wife looked well cared for and happy, and Bernardo sold the quality of his work with fierce pride. Ben initially wanted to write Bernardo a check, and though his face fell, he agreed. By the time he finished his work though, we paid him in cash. We don’t know anything about him, but I doubt he had a bank account, and someone who looked like him might have a hard time getting a personal check cashed in town. We left the next morning. I’m sure Bernardo is out there waiting for another opportunity to ply his trade and hone his skills. I wish him the very best, and If I ever come back, I hope I see a sign that says “Bernardo’s Dent and Collision.” It’s his dream he came here to fulfill. I hope he gets to do just that. Postscript: We pulled into the campground that will be our home for about a week. We are camping with friends. They had just parked their Jeep and we were relaxing when we heard a sickening crunch. Someone towing a huge trailer clipped the Jeep. As we ran to survey the damage, I grabbed the piece of paper with Bernardo’s phone number. Nice, Pam. Read it shortly after we spoke.